Dandeli-Anshi is the fourth tiger reserve of Karnataka state,located in Uttara Kannada district.It got Tiger Reserve status in January 2007.It is spread over 1365 Sq.Km which includes Dandeli Wildlife Sanctuary and Anshi National Park and has satisfactory remarks about tiger density.It is also a home for endangered Hornbill species and rare black panthers. "People without children would face a hopeless future; a country without trees and wildlife is almost as helpless". I still remember my childhood days when I used to visit Dandeli a place where even my father started his professional career and also where my most of the relatives were staying.Even though I never brought up in Dandeli no one could stop me to go there since it was just two hours journey from my native. And during every visit I used to get the scoldings from my father and relatives since I used to spend most of the time in forests than in house.So as I grown up my visit to Dandeli became very less except twice or thrice in a year since I became busy with studies but always I had in my mind that I should contribute something to these magnificent forests which inspired me a lot to fall in love with the Conservation.So it is just an attempt from my side to create awareness to save these magnificent animals and landscapes they exist in.If this blog contributes in a small way to achieve this goal I will be the most happiest person in this world. This blog mainly focuses towards conservation activities in and around Dandeli-Anshi Tiger Reserve.This blog doesn't provide any information regarding tourism and its related activities in and around Dandeli-Anshi Tiger Reserve. The finding, supported by photographs taken by hidden camera traps, established that the tiger from the Bhadra tiger reserve moved out of its home range and formed a new territory at Dandeli-Anshi reserve. Scientists and tiger experts in the State are as excited as they are baffled, as the discovery may go to render the camera trap a reliable method to monitor tigers. 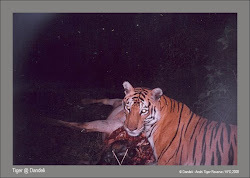 The finding, resulting from three years of study, began with the camera trapping a four-month-old cub that was photographed along with his sister and mother for the first time at Bhadra in April 2006.In October 2006, a wildlife photographer captured it on camera while it was trying to corner a gaur in the company of another tiger. The bombshell came in May 2008, when the cub, now a two-year-old, was first pictured at the Dandeli tiger reserve. Yet again in 2009, a camera trap in Dandeli photographed it. The picture was sufficient proof of the migrant tiger having set up its territory over there – 270 km from its native home range. How did the Wildlife Conservation Society (WCS) establish that the tiger was from Bhadra? It is well established that the stripes of the tiger, like human fingerprints, are unique to each animal. Tigers photographed by camera traps are classified by their stripes for monitoring purposes. The cameras are placed at crucial places where the animal movement is frequent. The traveller-tiger is among 11 individuals trapped by camera at Bhadra, and after it was photographed again at Dandeli, was identified by its stripes. The WCS has created a database of individual photographed tigers. Scientists say that Indian tigers, governed by the availability of prey, do not migrate for a long distance, unlike the Siberian tiger which tend to travel up 500 kilometres in search of prey. WCS India director Dr Ravi Chellam said the home range of tiger was believed to be 60 sq km. “This has opened avenues of study, because there is human habitat en route, and it (tiger) could not have travelled as the crow flies,” he said. 1956- Dandeli Wildlife Sanctuary (DWS) was declared as a game sanctuary covering an area of 127.71sq.km. 1975 - The area was declared as a wildlife sanctuary and it was expanded to 5,729.07sq.km. 1987 – An extent of 250 Sq. Km has been declared as “Anshi National Park (ANP)”. 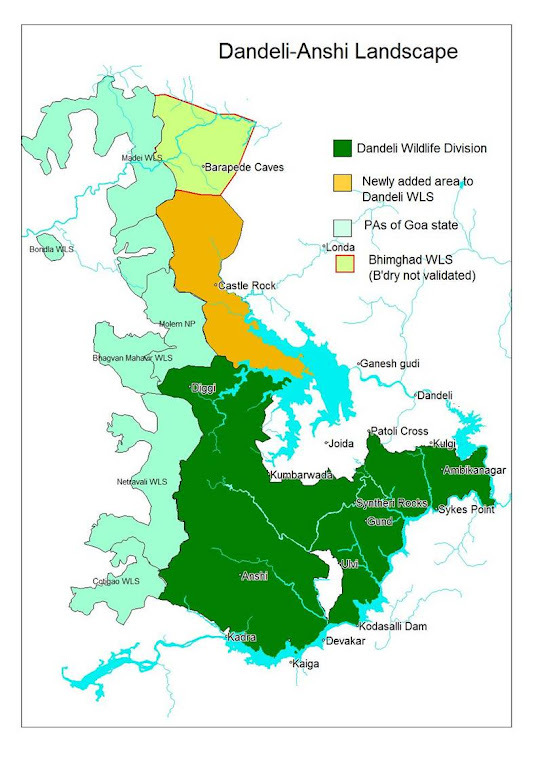 1998 – An extent of 475.018 Sq.kms has been declared as “Dandeli Wildlife Sanctuary. 2003- Area of Anshi National Park has been extended to 339.866 Sq. Km. 2007- An extent of 814.904 Sq. Km which includes DWS of 475.018 Sq. Km and ANP of 339.866 Sq. Km has been declared as “Dandeli-Anshi Tiger Reserve(DATR)” on 4th January 2007. 2008 -An extent of 163.3303 Sq. Km has been added to the existing DWS area i.e., 475.018 Sq. Km and hence the DWS covered an area of 638.2483 Sq. Km. 2009- Anshi-Dandeli Tiger Conservation Foundation has been constituted. 2009 - An extent of 77.4823 Sq. Km has been added to the existing ANP area i.e., 339.866 Sq. Km and hence the ANP covered an area of 417.3483 Sq. Km. 2010 - An extent of 282.63 Sq. Km has been added to the existing Core/Critical Tiger Habitat of 814.904 Sq. Km and has been declared as the buffer area for DATR. 2011- An extent of 248.0601 Sq. Km has been added to the existing DWS area i.e., 638.2483 Sq. Km and hence the DWS covered an area of 886.41 Sq Kms. Dandeli-Anshi Tiger Reserve(DATR) is spread over 1365 Sq.Kms and is divided into Dandeli wildlife sub division and Anshi wildlife sub division which are further divided into six ranges. DATR is headed by Conservator of Forests who also serves as director, sub divisions are by Assistant Conservator of Forests and ranges by respective Range Forest Officers. The reserve is spread over Haliyal, Joyda and Karwar taluqs. The Administrative Office is located at Dandeli city. But most of the activities like wildlife safari, Nature camps etc are being conducted at Kulgi Nature Camp which is located 10 kms from Dandeli city. Bangalore to Dharwad (420 km), on to Dandeli (52 km) and on to the Sanctuary (10 km). Mumbai to Belgaum (480 km), on to Dandeli (95 km) and on to the Sanctuary (10 km). Due to the rampant mining in the late 1990s,wild animals were under great disturbance due to the environmental pollution and were nearly wiped out. Hydro-Electric Projects have been constructed in the heart of the reserve at six different locations Nagazari,Kadra,Kodasalli,Supa,Tattihalla,Bommanahalli which has resulted in major habitat loss and proportionally the migratory paths of the wild animals got blocked and the animals which had the territorial significance have lost their territory. State Highway Londa-Sadashivgad(SH-95)passes through the Tiger Reserve which connects Belgaum district to Karwar District. North Karnataka's most famous pilgrimage placeShri Ulavi Channabasaveshwara Temple is situated in the heart of the tiger reserve and attracts nearly lacks of tourists every year.But during the time of Temple's annual fair (February), it has been observed that pilgrims visiting to temple are trespassing into the forests to collect firewood and other forest products,littering in the forests etc which has sometimes resulted in forest fire and also causing great disturbance to wildlife. Another great cause is Synteri Rocks which is situated in the reserve is being polluted and disturbed by tourists like throwing plastics,littering,playing music loudly,trespassing into other areas etc. which is strictly prohibited. This is one of the oldest paper industry in India started in 1955 and is the fifth largest producer of paper products in the country.But it has been found that WCPM releases its effluents from the paper making process into the halamaddi Nala,which flows through the WCPM and merges with the Kali river half a kilometer from the mill.A January 2003 report of the Central Pollution Control Board (CPCB) shows that the mill has been discharging insufficiently "treated" effluents in excess of allowed quantities (almost twice as much) into the Kali River which is a life-source for the wildlife of Dandeli-Anshi Tiger Reserve.In addition, CPCB found that the flow meters installed by the WCPM to be faulty.In fact,KSPCB had already issued a show-cause notice to WCPM regarding these meters in August 2002. A December 1999 ISRO study commissioned by the mill to assess the possibility of ground water contamination found that one kilometer stretch of the Kali River was affected and ground water was contaminated in villages situated along the river. As we all know Dandeli is a perfect tourist destination in India as it provides best opportunities for nature and adventure lovers i.e., Wildlife safari into Tiger Reserve,White Water Rafting,Angling,Kayaking,Mountain Biking etc.But recently it has been observed that tourists' hotspots like Synteri Rocks,Ulavi Temple,Kavala Caves,Sathkhand Falls,Sykes Point,Nagzari Power House, Kulgi Nature Camp,Anshi Nature Camp etc. which are located in the heart of the Dandeli-Anshi Tiger Reserve are being polluted and disturbed by tourists due to throwing plastics,playing music,rash driving,littering,trespassing into the prohibited places etc.These activities not only pollute the environment but also causes great disturbance to wildlife and it is also the violation of Wildlife Protection Act. So my sincere requests at the tourists is love and enjoy the nature but without disturbing it.Because already we lost good number of forests so now we have to save at least the remaining part. Dandeli-Anshi Tiger Reserve is a mixture of Moist deciduous with Bamboo,Teak and Semi Evergreen Forests. Dandeli Wildlife Sanctuary has mainly moist deciduous forest areas in which Teak and Bamboo having dominance. Anshi National Park has mainly semi evergreen and evergreen forest areas in which Bamboo vegetation is very low but has very rare plant species. Dandeli-Anshi Tiger Reserve is home to very rare and endangered wildlife. Main predators are Tiger,Leopard,wild dog(dhole),sloth bear.However the density is too low due to least prey density.As per the Wildlife Census 1997,there are 13 tigers recorded out of which 11 are in Dandeli Wildlife Sanctuary and 2 in Anshi national Park.Leopards are in good number out of which 40% are black.Wild dogs are in very less number and these are usually sighted in Kulgi and Phansoli Ranges.Sloth bears are in very good number and these are frequently sighted in Ambikanagar,Virnoli,Bhagavati areas. Main prey animals are barking deer,spotted deer,wild boar,sambar,gaur.However the density is too low due to poor grassland.But recently part of Joyda forests have been added to tiger project where the grassland is very good and we can find gaurs and other prey animals in good number.Apart from this DATR is also an important elephant corridor between Karnataka and Maharashtra holds at least 47 elephants which are frequently sighted near Bommanahalli Dam backwaters.We can also find malabar Giant Squirrel,Slender Loris etc. Dandeli is a paradise for birds.272 birds are listed in the reserve out of which 19 are considered to be endemic.Some of the important birds are Malabar Trogon,Malabar Pied Hornbill,Malabar Grey Hornbill,Indian Grey Hornbill,Great Indian Hornbill,Emerald Dove,Ceylon Frog mouth,Pompador Pigeon etc. Kali river is a home to at least 200+ marsh crocodiles and good number of these can be sighted near Dandelappa temple in dandeli city.Another rare reptile found is draco(Flying Lizard) which can be easily sighted near Mandurli IB,Anshi Nature Camp,Sathkhand falls.There are wide variety of snakes can be found especially in Anshi National Park i.e., King Cobra,Cobra,Malabar pit viper,Hump nosed pit viper,Bamboo pit viper,Kraft,Ornate flying snake,wolf snake etc. There are also wide variety of butterflies found in the reserve.Some of them are Crimson Rose,Common Rose,Leaf,Clipper,Tigers,Southern Bird wing,Cruiser etc. There are totally 52 Villages which includes 4725 families are residing at Core/Critical Area of DATR which is third highest in the country's tiger reserves after Ranthambore in Rajasthan,Melghat in Maharashtra respectively. Source: "STRIPES May-June 2010(Volume 1, Issue 4)-A Bimonthly Outreach Journal of National Tiger Conservation Authority(NTCA) Government of India. As already stated DATR is a combination of Evergreen and Semi evergreen forest patches.Since the grassland is very poor and vegetation is very thick , the prey animals density such as spotted deer,gaur is very low compared to Bandipur,BR Hills and Nagarhole forests which are rich in grassland and prey density.So normally predator density is also quite low.Tourists are always get disappointed for poor sighting of wild animals in these forests during their safari.But many people who are residents of Dandeli forests since many years including forest staffs could not able to sight a tiger till now. I am also visiting Dandeli forests since many years but till now i have also never seen a tiger here .One day one of my friend (who has visited dandeli forests rarely) was going to Dandeli on bike at 9 30 AM and suddenly just near to Kulgi Nature Camp tiger was crossing the main road(Ambika Nagar-Dandeli).So it all depends on the luck. The third day of the tiger census lifted the flagging enthusiasm of volunteers and forest department officials at the Anshi and Dandeli forests, after rich signs of tiger presence were reported. The volunteers were unable to detect major signs of the wild cats’ presence on the first two days of the all-India census. But on Sunday, the third day of the recordings, officials reported signs of scats, pug marks of adult tigers and litter, and hearing roars. One tiger was also reportedly sighted. Though experts say this is a good sign, they feel it is too early to celebrate. “I am very happy with the present situation. It indicates that the tiger population in Karnataka is improving,” principal chief conservator of forests (wildlife), BK Singh, told DNA. The Anshi-Dandeli tiger reserve comprises evergreen forest patches, and was declared as a tiger reserve two years ago. Anshi is spread over 399.87 sq km, and Dandeli occupies 600.32 sq km. A senior official at the Wildlife Institute of India, Dehradun, said that it was a good sign that the tiger population was roaring back. He said that tigers have a tendency to bounce back and breed well in conducive habitats. Bhargav said that there are a lot of recovery processes, like carnivore and prey recovery, that need to be introduced. “There are a lot of problems which need to be addressed, especially if the census results are showing healthy tiger population in both the reserves. There has been practically no improvement in the rehabilitation of villages, which is adding to the menace,” he said. I am a passionate wildlifer and currently working as a Software Engineer in Bengaluru . Two protected areas, viz., Anshi National Park (ANP) and Dandeli Wildlife Sanctuary (DWS), are situated on the northwestern side of the Uttara Kannada district in Karnataka State. Dandeli WLS and Anshi NP are linked to six protected areas in the neighboring states of Goa and Maharashtra. Together this region forms a contiguous forest patch of about 2,200 sq. kms with pockets of intact prime habitat for tigers and other habitat specialist wildlife species. The contents of this blog are informatory in nature.Since some of the information is not editable the owner of the blog does not take any liability for the same if the contents are wrong.